My youngest son has a peculiarly awesome fascination with pi. At the age of 6 he decided out of the blue to memorize the first 100 digits of pi. He’s currently working on pi 1000. The other day we were driving around town and he was staring off into space in deep thought. I asked him what he was thinking about and he answered, “I’m thinking about how to power a car with pi when I grow up”. [Insert shocked face emoji]. I am not sure I’ll ever understand what bounces around inside his brain, but one of our many jobs as parents is to foster the formation of more neural connections in our kids’ brains, specifically as it relates to topics that interest them. With that in mind, I decided to create this data art of pi for my son’s 9th birthday. I implemented an algorithm that read through the first 10,000 digits of pi, grouping and counting all the 2 digit pairings, then converted the output to a beautiful piece of data art which hangs in our son’s room. Happy birthday, dude. I’ll be the first in line to buy your pi-powered car. 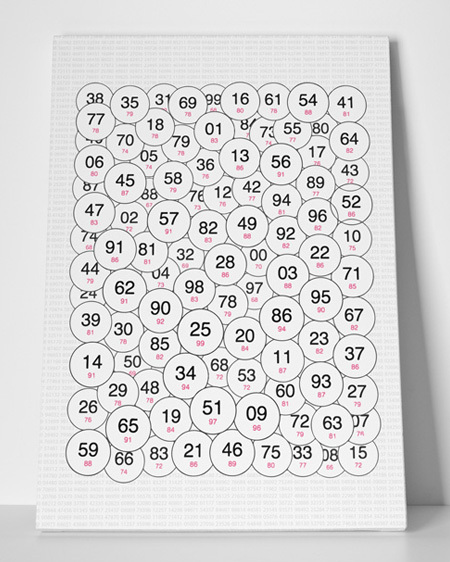 Note: the black numbers denote the pairings found in pi 10,000, the pink numbers denote the number of times each pairing occurs. The pairings with a higher frequency come to front, while ones with a lower frequency are forced to the background.